Dream catchers are beautiful handmade objects that consist of a willow hoop covered with a net or webbing. 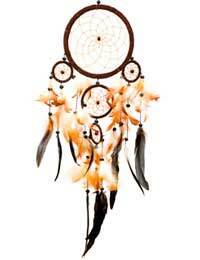 Dream catchers are often decorated with personal and sacred items such as beads or feathers. You can find dream catchers sold as souvenirs at almost any store that specialises in Native American merchandise. Originally, they were made on a small hoop, but as their popularity grew, many are now made out of larger hoops and hung on the walls as decoration. Many people purchase the dream catchers for their beauty, but may not fully understand the concept behind them. While many Native American tribes have embraced the legend behind the dream catcher, it was the Ojibwa tribe that originally created it. Dream catchers were created by tying strong deer sinew strands around a circular or tear-shaped willow frame. The result looked like a spider's web. In fact, in the Ojibwa language, the dream catchers were called asabikeshiinh, the inanimate form for the word 'spider'. Traditionally, parents would create the dream catcher for their young children. Hung above the bed, the Ojibwa believed the dream catcher would protect the children from nightmares. The dream catchers would watch over the children until they reached adulthood, as the willow and deer sinew would eventually dry out and give way. The Ojibwa believed that only good dreams would filter through the dream catcher, sliding down the feathers to the sleeping person while the bad dreams are caught in the web, eventually disappearing. The legend of the dream catcher is that a spiritual leader named Lakot had a vision of Iktomi, a trickster and teacher of wisdom. In this vision, Lakot appeared as a spider. Iktomi took Lakot's willow hoop and he began to spin a web around it, working from the outside inward. As he spun, he mentioned the cycles of life: from infanthood, to childhood, to adulthood. Once we reach old age, he told Lakot, we must again be taken care of as infants. He then spoke of forces found in life, both good and evil. When he was finished with the web, he explained to Lakot that the dream catcher was a perfect circle except for the hole in the middle. He said that the dream catcher webbing would catch all good ideas, while the bad ones would fall through the hole. Today, dream catchers are made with wood or even metal hoops wrapped in leather strips, to help preserve them. The webs are made of artificial sinew. They come in many different sizes, from those small enough to hang from your rear view mirror to those large enough to mount on a wall. During the 60's and 70's, Native American tribes sought for a symbol of unity amongst themselves and many adopted the dream catcher as that symbol. Many New Age believers have also taken to the legend of the dream catcher. They view dream catchers not just as a tool to collect good dreams and eliminate bad dreams, but also one to help us understand our dreams. The opening is often viewed as symbolic of the changes that will occur in your life. Dream catchers should be hung near where you sleep, whether it be on the bed or on the wall. If you feel your dreams have become too active, you can stop that temporarily by laying the dream catcher on a flat surface. Dream catchers can be beautiful works of art, but also remember that Native Americans believe they are keys to what they called 'night visions' - our dreams.